Standard width and height will be determined by the type of specific garage door. While building a new garage it is better to check available sizes, make a selection and create a rough opening according to manufacturer specifications. Typically one big door for two car garage will cost less comparing to installing separate smaller doors for each car. First column in the above chart is in imperial system (width x height in feet) and second column is in metric measurements (garage door width x height in centimeters). 9 and 10 feet high garage doors are less common. Some manufacturers offer width from 7’ up to 18’ with 1’ increment. Always consider the car dimensions while designing a door opening and choosing right size of the garage door. A 8 x 7 feet door will be the perfect option for any mid-size sedans and most of SUVs. Bigger trucks will fit in 9 x 8 doors with very few exceptions. For a high roof cargo or passenger vans similar to Mercedes Sprinter it might be better to go with a higher door. But, in general, oversized vehicles for everyday personal use are not very common. Make sure garage itself has sufficient head room for the door opening, which often has to be minimum 6 – 7 inches. But electrical door opener will require more space and typically 14 - 18 inches distance from the door track to garage ceiling will be sufficient for proper installation and fully functional opener. 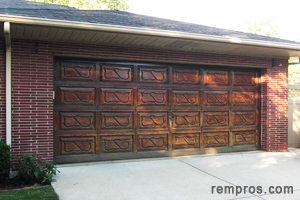 Hinged wood garage doors might be made by a carpenter at the job side according to any odd opening. But manufacturers also produce prefabricated ready to assemble and install units with door frame and door panels. Dimensions of such doors might start from 6’ in width and go up to 18’ with one feet increment and from 6’6” to 9’ in height with 0.5 feet increment. While designing a garage, and an opening for a door in particular, always check your local building codes. Some garage door sizes, usually wider or higher might be restricted from use in certain areas. Weight of garage door might be important for a shipping purpose. Section 8’ x 8 24 gauge steel door with tracks and all accessories might weight from couple to a few hundred pounds. Some materials might be much heavier. But in any case installation of a garage door is not one person project and even experienced pros always work with a helper to complete the project timely and efficiently.